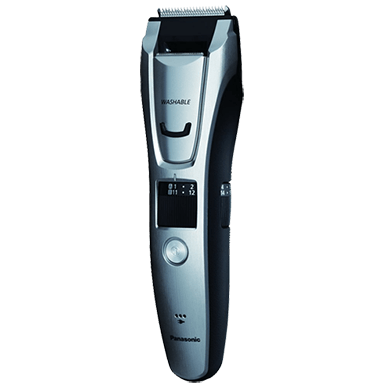 Panasonic is a trusted brand of men’s shavers and hair trimmers, and some of their products have won awards, such as the Panasonic ER-GB80-S body and beard trimmer. They aim to provide the highest standards of comfort, quality, and reliability. 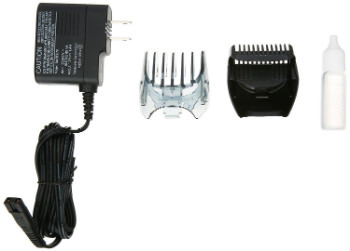 This hair clipper provides a reliable way for men to shave shorter hair styles or trim facial hair to desired length. 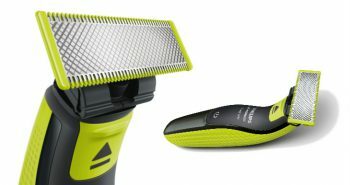 This trimmer has a medium gray plastic case that gently tapers upwards to allow the hand to grip it more easily. This trimmer is washable and rechargeable. This is a dual-use trimmer. It can be charged up and used cordless, or it can be plugged into the wall outlet and still be used. Some rechargeable trimmers don’t have this function, but it will provide peace-of-mind knowing that no matter what the charging level is, it won’t let you down in the morning. The trimmer is designed with an ergonomic design. It has a rubberized grip along each side. This not only makes it comfortable to hold in the hand, but it prevents it from being dropped in the sink or shower. There is a large on/off circular power button on the lower 2/3rds of the front of the Panasonic ER-GB80-S. There is a small square LED readout panel above this button. 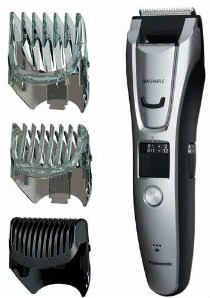 There are three different comb attachments for the Panasonic ER-GB80-S body and beard trimmer. These three combs give you a vast number of hair clipping lengths, about thirty-nine choices, which should be enough to please even the perfectionist. It’s simple to choose which comb you need. The shortest tipped comb is better for shorter beard or hair styles, while the longer tipped hair comb is for men who like to allow their hair to grow longer. Inside the trimmer are durable and super-sharp blades. They are designed at a forty-five degree angle, and are made from hypo-allergenic stainless steel, to minimize allergic reactions, such as can happen when blades may be made of nickel. These blades effectively cut off hair quickly and easily, no matter if a man is using it to trim hair, beard, or body hair. The blades will cut through the most densest, thickest, and unruliest of men’s hair. The combs are what protects the skin from these extremely sharp blades. 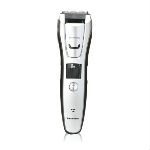 Besides the hypo-allergenic blades, there are other reasons why this trimmer is the best for men with sensitive skin. These blades are designed to minimize irritation, and avoid tugging or yanking out hairs. Since they’re so sharp, they’ll cut on the first pass. The three attachable combs provide an extra level of protection. 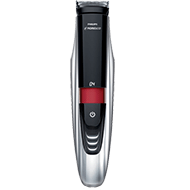 Besides choosing which comb is suitable, there is also a quick-adjust dial on the trimmer. Together, these provide over thirty-nine different precision settings. Each of these trim settings varies from 0.5 millimeters to twenty millimeters, to trim the most popular men’s hairstyle or beard styling lengths. 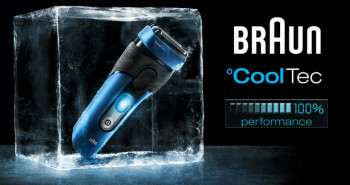 This truly provides for personal shaving, being more than a simple one-length trimmer. The dial can be adjusted from the middle side, and you can see the current setting just about the LED screen. 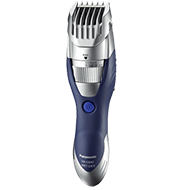 Men will also appreciate how simply it is to trim mustaches with this Panasonic ER-GB80-S trimmer. There is a slide-up trimmer located at the back top of the Panasonic. This is ideal for detailing sideburns and mustache. Once you’ve finished using it, it can be pushed back down into position. 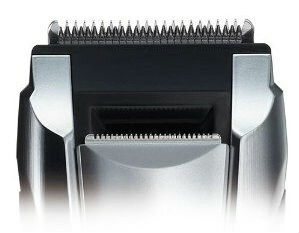 This trimmer is narrower and has smaller shorter blades than are in the main part of the trimmer. 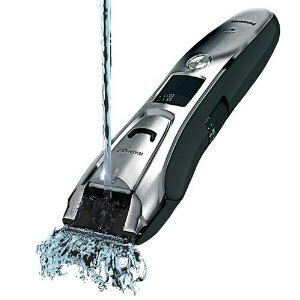 The Panasonic ER-GB80-S body and beard trimmer is simple to wash. It can be rinsed under the tap and patted dry with a towel. It’s recommended that the comb is removed first, and washed separately under the tap. The cleaning brush will help to make maintenance easier, removing those pesky tiny hairs that seem to get stuck in the tiniest corners of trimmers. One full charge of the trimmer provides fifty minutes of shaving time. This may get some men through the full month without needing to plug it in for frequent recharging. It will take one hour to charge up. This trimmer has a Ni-MH type of battery. It’s also great for traveling—there’s no need to pack the charger in the bag—saving space. Another great travel feature is that it has universal voltage for travel. Considering all the great features on the Panasonic body and beard trimmer, the price is around $100. The LED screen readout and the extra combs make it a great deal when compared to other manufacturer’s offerings. The LED indicator will tell you the charging progress when it’s attached to the charger, as well as the level of battery power when using the trimmer cordlessly. In the box you’ll get one Panasonic body and beard trimmer, model number Panasonic ER-GB80-S, pop-up trimmer, three styling combs, a cleaning brush, and one AC charger. The package weighs about 1.4 pounds. 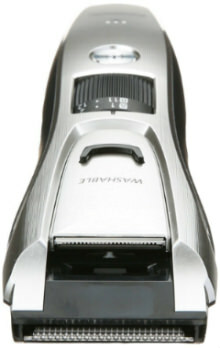 The trimmer itself measures 1.6 inches by 2 inches by 7.1 inches. 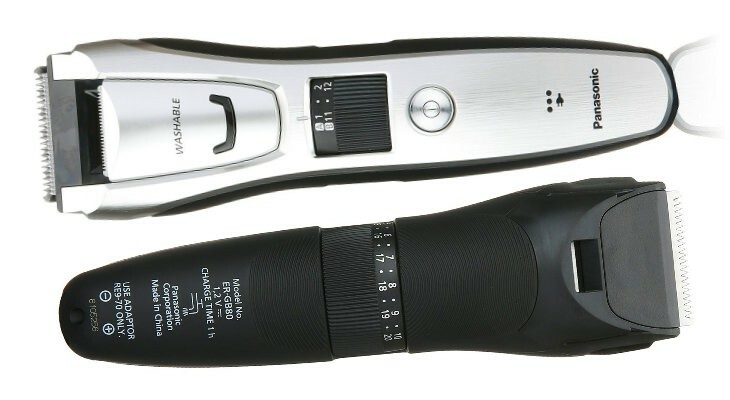 Trim, sculpt, cut, and detail—men will appreciate that they only need to buy one trimmer to cut all forms of hair. 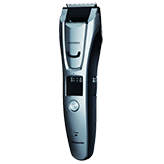 The thirty-nine trim settings and pop-up mustache trimmer will enable men to trim to the precision hair or beard style that they prefer when using the Panasonic ER-GB80-S Body and Beard hair trimmer.